Besides giving children endless hours of entertainment, dimmer switches serve a lot of purposes. In a dining room, a dimmer switch is a great addition. You can turn it all the way up for Friday night pizza parties, or you can tone it down for romantic evenings with your spouse. In a bathroom, full-strength light is great for getting ready in the mornings, but at night you’d want a softer effect for a nice long bath. In a master bedroom, dimmer switches are perfect to help you wind down at the end of a long day. Many times, lighting will help set your mood. Well-lit rooms create an open and airy feel and it’s great to have that type of lighting for cooking, cleaning or just doing things around the house. A softer light automatically makes the mood more relaxed and is ideal for peaceful evenings at home or even entertaining. Installing a dimmer switch on your existing light fixtures can give you the best of both worlds. And it will save you money since you won’t have to put lamps with low-wattage bulbs in every room! Dimmer switches are a great way to get multiple uses out of the same room – for example, your kids can turn the light up all the way to clean their bedrooms (if you’re lucky!) or they can lower the lighting to surf the Web or play video games. Dimmer switch wiring can be tricky, though. It’s not as easy as the numerous do-it-yourself websites would have you believe. 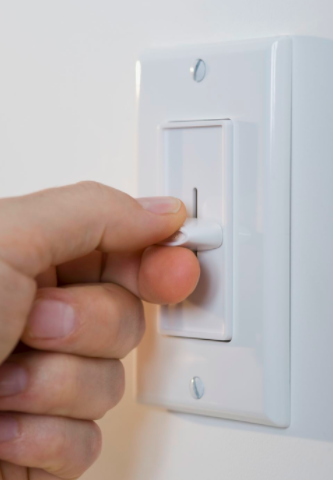 It’s important that dimmer switches be installed correctly so that you can avoid any electrical problems that could impact your entire electrical system. We have experience in installing all types of dimmer switches, from the most simple kind that is most often installed on a dining room chandelier, to the more complicated ones that can be controlled with a remote control or even an iPhone. If you already have a dimmer switch but you’re having trouble with it, call us. We can troubleshoot any electrical issue you have with your wiring system. If your dimmer switch emits a low-pitched buzz or hum, or if it’s warm to the touch, it needs to be replaced. Dimmer switches that were installed incorrectly or that have simply worn out could cause damage to your wiring system or even cause electrical fires. So don’t wait to get help with your new lighting look! We are your source for dimmer switch wiring, repair, and installation. Call us now!